The Chesterfield Check Black Shower Curtain is a great finishing touch for your Primitive or Country home. The black and oat colors bring a warm and timeless touch to your bathroom ready to greet you or guests. 72" x 72" this curtain is made of cotton. 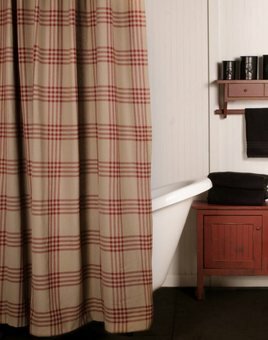 The Chesterfield Check Red Shower Curtain is a great finishing touch for your Primitive or Country home. The red and oat colors bring a warm and timeless touch to your bathroom ready to greet you or guests. 72" x 72" this curtain is made of cotton.